• Launched in April by St. Joseph the Worker. • Touted as Arizona’s first mobile job development office. • Travels to different locations each week, Monday through Thursday. • Contains laptops, a printer, closet full of various hygiene products, men’s and women’s clothing and space for a job developer to provide counseling. PHOENIX – Robert Batke came to The Crossroads Facilities, a recovery housing program, hoping to overcome substance abuse. Next he needs to find a job, something that’s been difficult for him since moving from Alaska in April. His help with the latter arrives each Monday in the form of a 36-foot RV dubbed the Mobile Success Unit. It’s operated by St. Joseph the Worker, an organization that helps low-income and homeless individuals find employment. On this Monday, Batke cautiously walked up the three steps and through the RV door to find Bob Smith, a greeter who shook his hand and instructed him to fill out paperwork for job help. 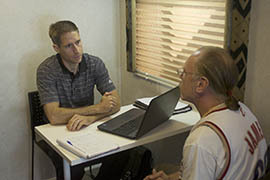 Then he met Daren Strunk, an employment outreach specialist, who combs through resumes to connect people with available positions. Strunk also helped update his resume, noting that Batke spent 30 years in a state government job in Alaska and explaining how the job market has changed in that time. Candace Sherwood, director of development for St. Joseph the Worker, said the Mobile Success Unit is Arizona’s first-ever mobile job development office and provides the necessary tools for people to get back on their feet and land a job. “Things happen and your world goes upside down, and now you’re job searching when you haven’t needed to write a resume in 15 years,” Sherwood said. In renovating the RV for its debut in April, the group added a closet full of hygiene products, a computer lab, a job developer area and a bigger closet to hold clothing for job interviews. 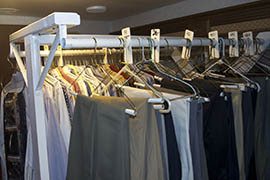 The back room, formerly a bedroom, is now filled with men’s and women’s dress clothing that is given to people for interviews and jobs. The main room used to be a kitchen and lounge area but now contains a computer lab and printer and is equipped with Wi-Fi. The Mobile Success Unit travels Monday through Thursday to at least seven locations with the greeter/driver, a job developer and a director from St. Joseph the Worker. Those three visit with hundreds of people a month to help them find jobs and get back on their feet. According to Sherwood, most people who enter the Mobile Success Unit have the ability to work the next day but are lacking specific tools, like nice clothes and hygiene products. Smith, the driver and greeter, said he tries to interact with the people as much as possible because sometimes they are nervous because they haven’t had a job in so long. 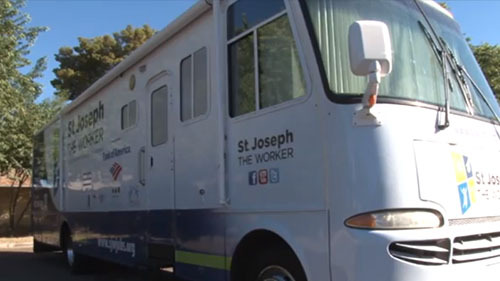 The charity St. Joseph the Worker has converted an RV into a Mobile Success Unit. Cronkite News reporter Megan Thompson takes us inside and show us what it offers and how it is helping people find employment. 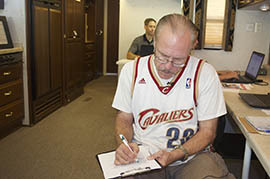 Robert Batke paperwork before talking with a job developer working in an RV converted into a Mobile Success Unit. Daren Strunk, an employment outreach specialist with St. Joseph the Worker, counsels Robert Batke on job options. 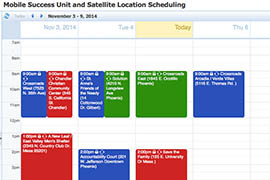 Click to view a calendar of where the Mobile Success Unit will go next. 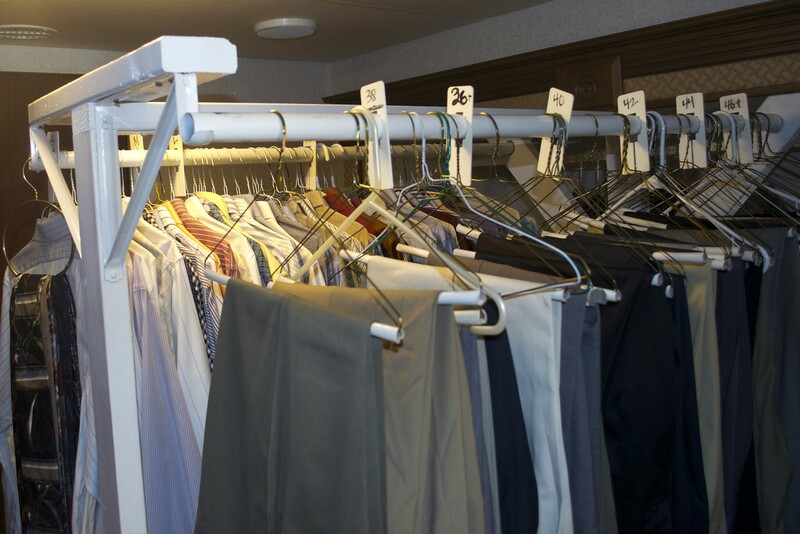 A converted RV converted into a Mobile Success Unit by St. Joseph the Worker includes dress clothes that clients can borrow for job interviews.